studio ATAH has completed an all-seasons dry snow ski resort in the qilu mountain region, qingzhou, china. the structure is designed to blend within its surrounding mountains and nature, with the piste being the only artificial feature visible against the naturally dark backdrop, while most of the architectural bulk is tucked below the piste itself, which terminates 12 meters above the access road. 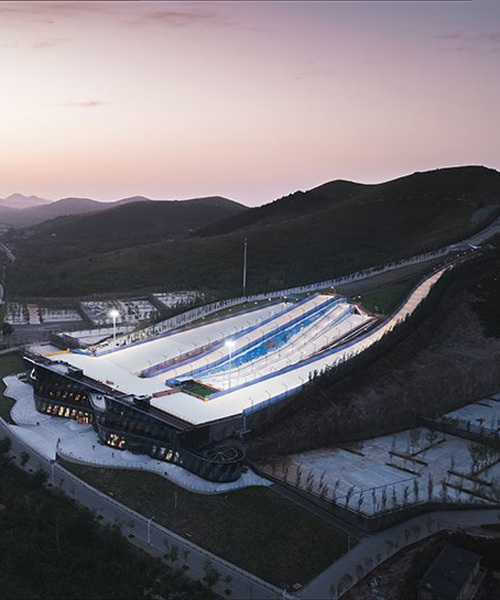 after beijing won the right to host the 2022 winter olympics, the national sports bureau has shown great support to the promotion of ice and snow sports, resulting to newly built sport facilities such as that of studio ATAH. during snow-free season, the ski resort is set to provide training grounds for the national single-board olympic team, and will be open to the public as a new sports entertainment attraction. the yunmen mountain all-seasons resort is designed on four basic principles: the continuation of the mountain ridges; the creation of sense of speed; the multi-dimensional extension of architectural programming; and the skiers’ varying line of sight. like wind blowing against strips of paper, the piste embraces the mountain ridge, with its south side corresponding to the large indoor space below, while the north side serves as the resort entrance, and circulation. towards the second and third floors, an open terrace space is defined for visitors to relax at the bottom of the piste. tucked bellow it, the 12-meter-long ski resort service center opens out to an access road, welcoming visitors and keeping support spaces out of the skiers’ viewpoint. on top of the resort’s third floor, observation points offer visitors the best possible views towards the field. the planning of the piste had been developed in close collaboration with slope specialist jian feng. slopes of varying difficulties and functions meet the needs of different programs, with a 10 degrees lane at the primary level, 15 degrees at the intermediate level for snowboarding run, and the tubing slopes, set at 6, 15, and 20 degrees respectively. all indoor spaces are connected by a service corridor along the mountain terrace, while three large elevators cater to the need of skiers and their gear. additionally, an indoor ski facility for kids can also be used as a shelter for all during sudden changes in the weather.